A smaller share of Americans currently serve in the U.S. Armed Forces than at any time since the peace-time era between World Wars I and II. During the past decade, as the military has been engaged in the longest period of sustained conflict in the nation’s history, just one-half of one percent of American adults has served on active duty at any given time.1 As the size of the military shrinks, the connections between military personnel and the broader civilian population appear to be growing more distant. While most Americans today have family members who once served or are currently serving in the armed forces, there is a large generation gap on this measure. In a recent Pew Research Center survey, more than three-quarters (77%) of adults ages 50 and older said they had an immediate family member –a spouse, parent, sibling or child – who had served in the military. For many of these adults, their military family members are likely to have served prior to the phasing out of the military draft in 1973. However, adults under the age of 50 are much less likely to have family members who served in the military. 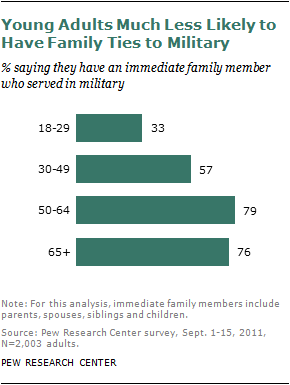 Some 57% of those ages 30-49 say they have an immediate family member who served. And among those ages 18-29, the share is only one-third. This gap may be attributable in part to a life cycle effect – younger adults are less likely to have a spouse or a grown child, so they have fewer opportunities to have a family member who has served in the military. They may accumulate more military family members as they age. But even when controlling for these factors, the age gap persists. Adults under age 50 who are married and those who have grown children are less likely than their older counterparts to report that these immediate family members served in the military. The Pew Research study also included a survey of military veterans. It found that veterans are more likely than members of the general public to have family connections to the military. Seven-in-ten veterans say they have an aunt or uncle who served in the military. This compares with 62% of all adults. Fully half of military veterans have a parent who served, compared with 41% among the general public. And 43% of veterans say they have a sister or brother who served in the military, compared with 27% of all adults. The biggest gap in terms of family connections is in the share that has a child who has served in the military. Veterans are more than twice as likely as members of the general public to say they have a son or daughter who has served (21% vs. 9%). Members of the public are more likely than veterans to say they have a grandparent who served in the military (51% vs. 37%). Overall, roughly eight-in-ten veterans (79%) have an immediate family member who served in the military. This compares with 61% among the general public. This military-civilian gap is much wider among younger respondents. Among those under age 40, 60% of veterans have an immediate family member who served in the military. This compares with only 39% of all adults younger than 40. Among those ages 40 and older, the gap is much smaller: 81% of veterans compared with 74% of all adults in that age group have an immediate family member who served in the military. The survey shows that Americans who have family connections to the military have different views from those who don’t on a range of topics related to patriotism, the military and national security. However, there are no significant differences between the two groups in their views of the wars in Iraq and Afghanistan. There is a widely held perception among both veterans and civilians that the public does not understand the problems faced by those in the military. In the Pew Research surveys, 77% of veterans expressed this view, as did 71% of the general public. 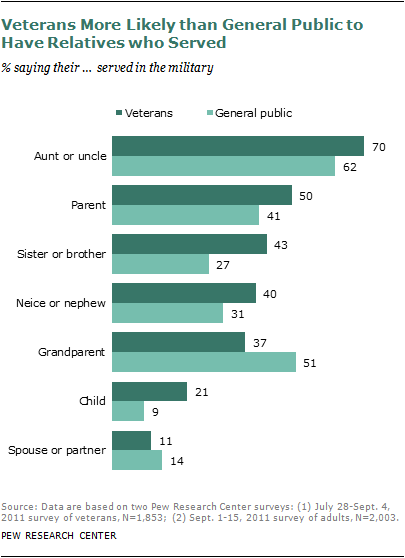 Americans who have an immediate family member who served in the military are more likely to say the public doesn’t understand the problems service members face. Some 75% of those with a military family member say this compared with 65% of those who do not have an immediate family member who served. Adults with family connections to the military are more likely than those without these connections to consider themselves highly patriotic. 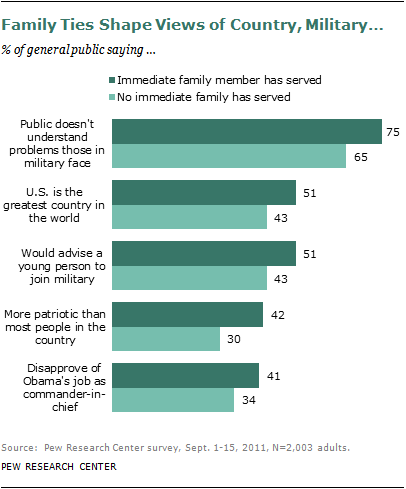 Among those who have a military family member, 42% say they are more patriotic than most people in the country. Only 30% of adults who do not have an immediate relative who served in the military say they are more patriotic than most people. For their part, veterans are even more likely to see themselves as highly patriotic: 55% say they are more patriotic than most other people in the country. Having a family member who served in the military is also associated with views about America’s standing in the world. Among those with a family connection to the military, 51% say the U.S. is the greatest country in the world. Adults who do not have a family connection to the military are less likely to feel this way – 43% say the U.S. is the greatest country in the world. In addition, those who have an immediate family member who served in the military are somewhat more likely than those who do not to say they would recommend a career in the military. Half (51%) of those with a family member who served say they would advise a young person close to them to join the military. This compares with 43% of those who do not have a military relative. Among veterans themselves, fully 75% say they would recommend a career in the military. Those with family ties to the military tend to be more critical of the way Barack Obama is handling his job as commander-in-chief. However, their views of the wars in Iraq and Afghanistan do not differ significantly from those who do not have a family connection to the military. Among those with an immediate family member who has served in the armed forces, 41% say they disapprove of the way Obama is handling this aspect of his job. Fewer among those without a relative who served (34%) say they disapprove. Overall, the public is skeptical that the wars in Iraq and Afghanistan have been worth fighting. A 57% majority of all adults say the war in Iraq has not been worth fighting, while only 36% say it has been worth it. And just over half (52%) say the war in Afghanistan has not been worth fighting, while 41% say it has been worth it. Those who have military family members and those who do not have nearly identical views on the wars. In addition, a similar proportion from each group (51% of those with an immediate relative who served and 49% of those without one) say they feel the wars have made little difference in their lives. Putting aside their views on the wars, the survey finds that adults with family ties to the military are more likely than others to have reached out to current members of the armed forces and their families. Among those who have an immediate family member who served in the military, 81% say they have thanked someone in the military for their service since the wars in Iraq and Afghanistan began. Among those without a military relative, 67% say they have done this. 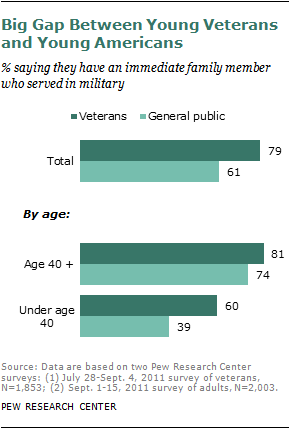 In addition, those with military relatives are somewhat more likely than those without military relatives to say that, since the wars began, they have felt proud of the soldiers who are serving in the military (94% vs. 87%). Overall, six-in-ten Americans (61%) have an immediate family member who has served in the military. However, some segments of the population are more likely than others to have these family connections. Whites are more likely than blacks to have an immediate family member who served in the military (68% of whites vs. 59% of blacks). Hispanics are much less likely than either whites or blacks to have family ties to the military – only 30% say they have an immediate family member who served. 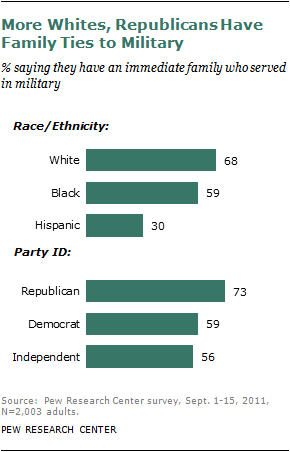 Republicans are more likely than Democrats or independents to say they have a family connection to the military. Nearly three-quarters of Republicans (73%) say they have an immediate family member who served in the military. This compares with 59% of Democrats and 56% of independents. In addition, those who live in the South (64%) are more likely than those living in the Northeast (56%) or the West (57%) to say they have immediate family ties to the military. And city dwellers are somewhat less likely than those who live in the suburbs or in rural areas to say they have a family member who served in the military. The margin of sampling error for results based on the entire sample of veterans is plus or minus 3.5 percentage points. The two data sets were combined and the entire sample weighted by SSRS to match known demographic characteristics of the veterans population as reported by the U.S. Census Bureau. In addition, the post-9/11 oversample was weighted back to reflect its correct proportion of the overall veterans population. A detailed explanation of the survey methodologies and weighting strategy employed in this study can be found in “The Military-Civilian Gap”.